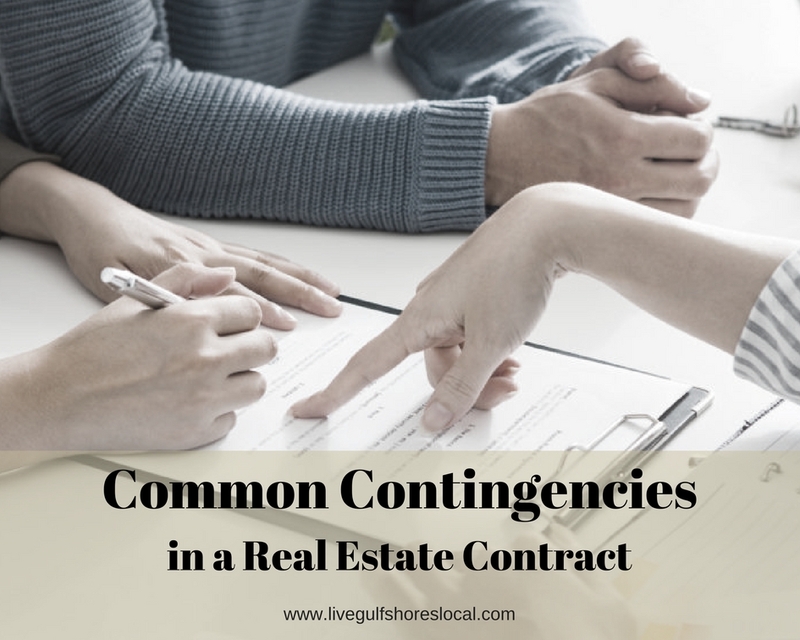 A Contingency is a very typical element in a real estate contract. As a matter of fact, it would be rare to not see one at all. So, first things first…..
What exactly is a contingency in a real estate contract? A contingency is a provision or condition that must be met in order for the buyer and seller to have a binding contract. In simpler terms, this must happen before that happens. There are literally dozens or even hundreds of things that could be a contingency in a real estate contract. For instance, the buyer could make the sale of the home contingent on the futon staying with the property (this actually happened to me). Another example could be the sale is contingent on the certainty that the home is located in a certain school district. It’s really unlimited what could be written into a real estate contract so I wanted to share with you the most common contingencies that we Realtors see on a daily basis. There are some contingencies that are required if you’re getting a loan and there are a myriad of others that are optional. If you’re getting a mortgage loan, you will see something like this in a real estate contract no matter where you live. So the sale of the property is contingent on you getting approved for a 30 year Conventional Loan (for example) in the amount of $300,000. Remember, this must happen before that. If this financial condition isn’t met, there is no sale. Notice how the seller had some protection as well. The seller can place a time on how long it will take for you to get qualified. This allows the seller to quickly put their home back on the market if the buyer can’t perform. If the buyer is getting a loan for the property, an Appraisal Contingency is absolutely required. Our contract states that the property MUST appraise for at least the purchase price. States vary on what figure to use depending on their own real estate and mortgage laws. I was licensed in another state prior to Alabama where the property would have to appraise for at least the loan amount. Get with your Realtor to see which one applies to you. Let’s say the appraisal came in at $290,000 on the property that had a purchase price amount of $300,000. In this case, there are 2 options: the seller would lower the purchase price to the appraised value or both parties walk away from the deal. There’s are Part B to the Appraisal Contingency that not many peope think about – Possible Repairs. If the appraiser demands certain repairs to be made in order for the property to hit the target purchase price, those repairs must be made by the seller or the buyer can walk away. Having a professional home inspection completed is a must no matter how old or what condition the home is in, but it’s not required. That’s right, it’s not a requirement but there’s never been a time in 13 years when I haven’t recommended my client to purchase a home inspection (even new construction). You would think that by buying a new construction home you would be safe but people make mistakes sometimes, even the city inspectors. A client of mine was buying a brand new home and I told them to get a home inspection. After looking at me funny, they did, and low and behold the inspector found an issue with the ductwork that everyone else missed. After the inspection has been completed the buyer will get a report with suggested repairs. Although Realtors can give their recommendations regarding the repairs, buyers can ask for as many repairs to be made as they want or none at all. Please note: There are time constraints that go along with most contingencies. For home inspections the buyer and the seller agree that the inspection will be completed and the repair request will be received by the seller within a certain amount of days. If that time expires beforehand, the contingency is void. Should the buyer and seller not agree with the repairs to be made, the buyer can withdraw from the contract (as long as they met the time deadline). If there is evidence of wood infesting bugs or water damage the home inspector will probably find it, however, this is an inspection that must be performed by a licensed and bonded termite control company. Unlike the home inspection, this report is not optional if you’re getting a loan for the house. The language in our contract reads….. In our part of the country our whole county is in a flood zone, however, there are different levels of severity and not every house requires flood insurance. Did you catch the phrase, “at a price and terms acceptable to the buyer and buyer’s lender”? Yet another example of “this must happen before that”. The buyer is not expected to purchase the home and will not be penalized for backing out if they can’t find insurance that is acceptable. This contingency is semi-common but I thought it should be included. There are good arguments on both sides of this topic on whether it’s a good idea or not so let’s get into it. A home sale contingency is when the buyer must sell (close) on their current home before purchasing the new property. This is simply just written into the Offer to Purchase Agreement. For one thing, you would never see this contingency in a seller’s market because there are so many buyers in the market that it would just be a waste of everyone’s time. If a seller accepts the offer with a home sale contingency in it, they will often write in a Right of First Refusal or Kick-Out Clause. This is usually a 48 or 72 hour period of time. Here’s what happens……Buyer A has a home to sell and goes under contract with the seller. Buyer A is in 1st position. Buyer B comes along, does not have a home to sell, and also wants to put an offer in on the seller’s home. Buyer A then has 48 or 72 hours to remove their home sale contingency or Buyer B will move into 1st position, assuming the rest of the terms are agreeable to the seller. Personally I don’t feel that this is a bad idea for sellers in a buyer”s market. In our case, the seller’s home still shows active in the MLS and it can still be shown like normal. The pressure is actually on the buyer to fulfill their duty and remove the contingency. Contingencies are really there for the protection of the buyer but they can get complicated. Although they favor the buyer, buyers need to realize that they have obligations too. There are rules. With all of these most common used contingencies in real estate contracts, there is always a deadline to meet. Just know that contingencies are normal in real estate and it’s rare to see an offer without at least one. It’s part of the process that both parties and their real estate agents work out together to meet the common goal of closing. Because real estate contracts are so complex, it’s crucial to work with a Realtor to guide you through the twists and turns that are so evident in buying a house. If you’re in lower Alabama, I’m your man! About the author: The above Real Estate information on Common Contingencies in a Real Estate Contract was provided by Jeff Nelson of IXL Real Estate – Eastern Shore. Jeff can be reached via email at jeff@livegulfshoreslocal.com or by phone at 251-654-2523. Jeff has helped people move in and out of properties for nearly 13 years. I service Real Estate sales in Baldwin County, including the cities of Spanish Fort, Daphne, Fairhope, Foley, Gulf Shores, and Orange Beach.